Bellingham, WA is closer to Vancouver, BC than it is to Seattle, giving this beautiful city a justly deserved reputation for clean air and marvelous scenery, proximity to the Cascades and Olympic Mountains as well as the Straits of San Juan De Fuca are given their just due. The city also prides itself for having numerous green spaces. 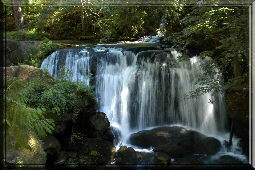 This beautiful waterfall is in one of those county parks.